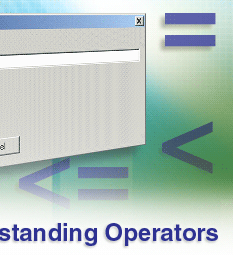 Operators are the function symbols like ‘>’ (for greater than) or ‘<’ (for less than) that help you specify what kind of information you’re looking for. For example, if you’re looking for stocks that are greater than $5, you would express it as > 5. Or if you only wanted stocks with an EPS Surprise of greater than 20%, it would be expressed as > 20. But what if you wanted stocks only from the top 5 sectors, that had P/E ratios within a certain range, growth rates greater than their respective industries, and then the top relative price performers within those industries. No problem for the Research Wizard. But most screeners would get stuck at number 1, let alone all the rest. 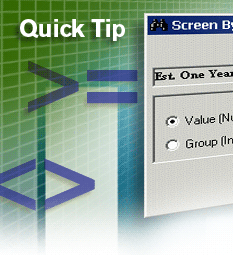 In this week’s Tips and Tricks, we’ll go over the different Operators and their functions so you can get the most out of your screening queries. Let’s take a look at all of the different Screening Operators that are available from the main Screening Window. The Operators (i.e., defining rules) are located in the drop-down Operator menu within the Screen By window. Note: In the image above, you’ll see the last Operator list is ‘Out’. But scroll down and you’ll find many more operators to select from. The different Operators and what they mean are listed below. Stocks that are not ADRs or American Depository Recepts. This will find the top 10 stocks with the largest % price change over 1 week. It would first find stocks with P/E’s less than 20 and then narrow down that list to the 10 stocks with the greatest % change in price over one week. It would first find stocks with the greatest % change in price over one week and then narrow that list down to stocks with P/E’s less than 20, conceivably producing no stocks. The other operators without an asterisk are boolean operators meaning the order of the items with those operators are irrelevant. The expression above would produce the same stocks whether the order of the items were reversed. In other words the sequence of these items does not matter. This will find the top 10% of stocks with the largest % price change over 1 week. If the active Universe of stocks is 8,000, then it’ll produce 800 stocks. If you narrowed the Universe down with other screening items to 300 stocks for example, applying the Top % operator (in this example 10%) would generate 30 stocks. This will find the 10 stocks with the smallest P/E ratio. Note: "Top" and "Bottom" operators refer to the value of a data item and do not imply qualitative characteristics of an item. In other words, they just select the largest or the smallest value. Example: If you wanted the 10 stocks with the best Average Broker Rating, you would not say Top # 10, but rather Bot # 10 since the smaller number is the ‘better’ number. This will find the 10% of stocks within the active Universe with the smallest P/E ratio. If there were 50 stocks in the active Universe, this would then produce 5 stocks with the lowest P/E ratio. This will generate the top 10 stocks with the best % price change in each X Industry. This will generate the top 10 stocks with the best % price change in each M Industry. This will generate the top 10 stocks with the best % price change in each Sector. If you then add additional items to the screen, it’ll narrow the list down to a smaller number of stocks, but still only pull stocks from the best 5 X Industries as you instructed. This will generate the 10 stocks with the lowest % price change in each X Industry. This will generate the 10 stocks with the lowest % price change in each M Industry. This will generate the 10 stocks with the lowest % price change in each Sector. items using these operators is important. The other operators are not, meaning the order of those items in your screen is not important. "Top" and "Bottom" operators refer to the value of a data item and do not imply qualitative characteristics of an item, they just select the largest or the smallest value. As noted above in the table of Operator definitions, the operators with the asterisk by it (*) which include the Top or Bot (Bottom) Operators (be it #’s or %’s) are ‘limiting’ operators and are sequential. What this means is that, the order you put these items in is important. Below are some additional examples to illustrate this. Let’s start off with an easy example to better understand this. The screen would first search the entire Universe for the Top 100 stocks based on the 12 Week Price Change or whatever item you chose. Then it would search for the Top 10 percent of stocks from that list of 100, based on the Projected Growth Rate. This screen would produce 10 stocks. The screen would now and firstly, search for the Top 10% of stocks based on the Projected Growth Rate from the entire Universe of stocks. Since there’s approximately 8,600 stocks in the Research Wizard, this item would narrow it down to best 860 stocks. Then it would search for the Top 100 stocks from that list of 860, based on the 12 Week Price Change. This screen would produce 100 stocks. So not only would you get a different number of stocks. The composition on that list would be different as well. Why would they be different? Because the first screen was picking the top Growth stocks from a list of the top Price Performers. 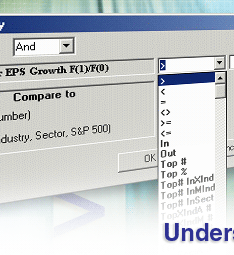 But the second screen was picking the top Price Performers from a list of the top Growth stocks. Here’s another example using the Sectors and Industries. This screen would first find the Top 5 Sectors with the best 12 Week Price Change . Let’s say they were: Energy, Basic Materials, Transportation, Utilities and Consumer Staples. Then from those 5 Sectors, it’d find the Top 3 X Industries within those 5 Top Sectors. This screen is first looking at the Top 3 X Industries with the best 12 Week Price Change. Let’s say all 3 were Finance related: Savings & Loans, Banks, and Insurance. Then from those 3 X Industries, the screen would search for the Top 5 Sectors. But since there’s only one Sector (Finance) represented in the previous criteria, only one Sector will come thru this screen (not 5). And it could (would in this example) be different than the first screen. Needless to say, you’ll also get a different number of stocks as well. So remember, when using limiting Operators such as these, the order is important. Tip: If you find that you need to change the order on some of your items, you do not need to start over. You can simply cut and insert the item where you want it to be. Left click on the item you want to move (it’ll highlight in blue). While the order is important for ‘limiting’ or sequential Operators; the order is NOT important when using the regular (or Boolean) operators like: >, <, =, <>, >=, <=, In, Out. Regardless of what order you put these in, it’ll return stocks that meet ALL of the above criteria. The order is irrelevant. Please refer back to the Table of Operators at the beginning of this article if you need further reference on which operators are sequential and which are not. The “Top" and "Bot” (Bottom) operators refer to the value of a data item and do not imply qualitative characteristics of an item. They just select the largest or the smallest value. For example: if you’re looking for stocks with the ‘best’ P/E ratios (lower P/Es are generally thought to be better than higher ones), you would use the ‘Bot’ Operator. This will produce stocks with the lowest P/Es. If you used the ‘Top’ Operator, it would generate stocks with the highest P/Es. So if you want the stocks or groups with the lowest values and you’ve decided to use the ‘limiting’ Operators, remember that the ‘Bot’ Operator will return the lowest values and the ‘Top’ Operator will return the highest values – regardless of it qualitative value. Start getting the most out of your screening today by using the different Operators above. And find exactly what you’re looking for, quickly and easily. That goes for stocks, Sectors and Industries. If you can think it, the Research Wizard can find it.